How to enter the moyo? Can Black show fighting spirits? 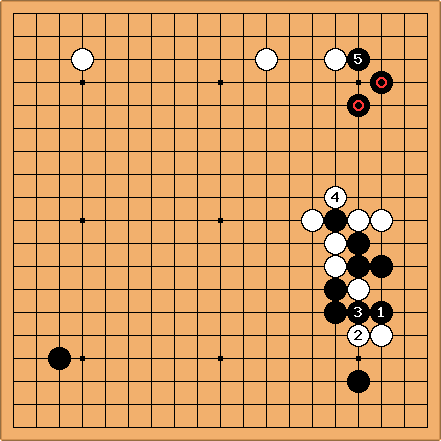 Velobici: Having played the marked Black stone, I feel compelled to discuss the position ;). I had hoped for . 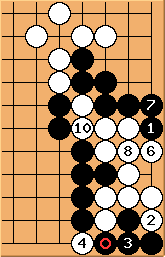 It prevents White from separating Black's stone by playing a, etc. JoelR: I don't think immediately kills. - save White. kokiri my feeling was that white shouldn't really live in this situation, but that if white can get the time to play a and force black to capture the stones, then it's probably good enough for white. 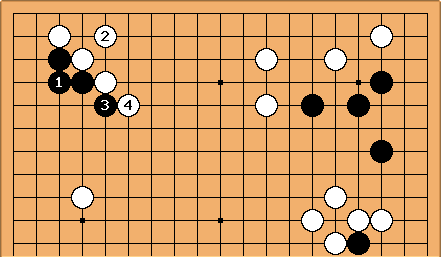 If killing isn't possible, then presumably black should take at a rather than play and then seek to force white to live on the side, rather than the corner. dnerra: I think the quickest way to live is to play at . JoelR: And, I don't think playing 127 at works either, Black loses the semeai. I have other questions about the sequence in the game. I would have played at , but that maybe my kyu-level aggressiveness. Also, I would have pushed at without playing / , on the 123 principle. 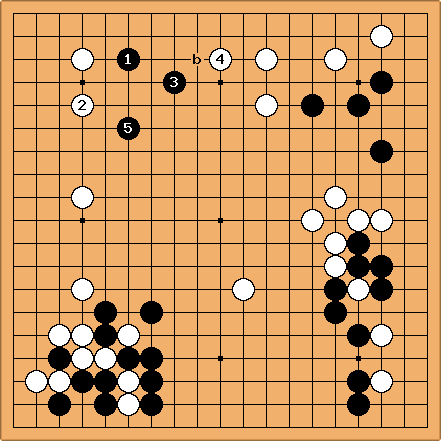 and would help White to reduce the black moyo (but yes, it might still be better than the game). Rich: minue622's comment implied (at least to me) that allowed black to kill; given the difference in skill level, I'm willing to believe that I've missed something, but I can't see it. Dieter: Throughout the sequence played in the game, I have never believed killing was possible, because of the throw-in tesuji and the aji of the marked stone (otherwise, making the farmer's hat as in the game, would have killed). Here is anothr variation where White lives. JoelR: Move 101 ( ) seems small to me. Yes, it does make shape and save the two black stones. 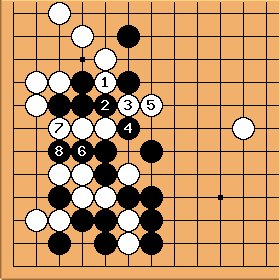 But it doesn't put any new threat on White's left side, and the three black stones already have a way out, below. Was this a chance for Black to take sente near or ? How does one choose a move in such areas? 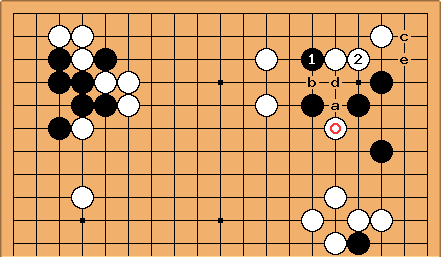 Rich: It seems reasonable to me; Black's play takes a lot of potential from the circled white stone. 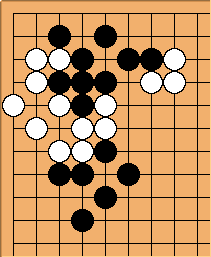 If black plays, say, , it leaves White with kikashi around the points 3-5 in the alternative diagram. If he plays straight away, at say 'a', and then plays , I don't think black is much better off than in this line of play; more a stylistic choice of thick vs. fast play, IMO. I'm only an SDK, so take that for what it's worth. DJ: Well, I thought that, slow as it is, is thick, it does poses threats on White's left side (at least as yose goes, I think) and it was casting a menacing glance at : what if Black played at instead? Still, I am a lowly 2k, so the advice of stronger players would be very welcome! JoelR: is indeed thick, and honte. I apologize if my comment sounded harsher than I intended. (I am a weaker SDK.) As Rich says, it's probably a matter of style. When I realized the three stones were safe, I started to think tenuki. If here, makes and destroys points. Worse, doesn't put any pressure on White and doesn't cooperate well with Bill's circled move: it's a slow combination. However, if Black doesn't move here (attacking elsewhere now that his upper left has few points to make but is strenghtened by Bill's move), White captures the squared stone in sente. All in all, the challenge here was to efficiently use Bill's move while keeping sente. I do not know whether my was the best way to do that, but certainly its follow-up at made Bill's move less efficient. minue622: This was what I worried about. Bill: This was not to argue with ( ) or ( ). But dnerra's joking comment about a ko threat might have left the impression that was smaller than it is. minue622: If you think is smaller than in this diagram, you are underestimating the thickness of white's center. 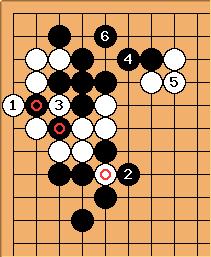 After , it is nearlly impossible for black to invade into left side, and white's center is going to expand. Tough situatiion for black. Bill: If I thought that, I would have said that Black should have played instead of . :-) ( in the game) and - both carry large threats, even though the difference between them is small if those threats are answered. That is characteristic of plays that are commonly called double sente. Should I have called them something else? Bill: (3 in this diagram), was double sente or close to it, I think. - carries a large threat in . 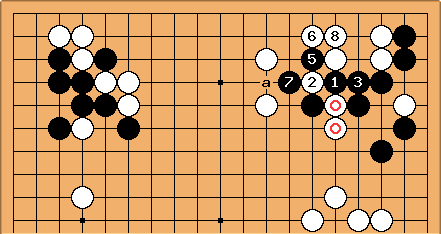 White can save her corner stones with - , but then White has a weakness at a and the stones are heavy. DJ: When White peeped at in the diagram below, Black hastened (most probably it was the right thing to do) to make eyes in the corner. Now, after the sequence in the game, White is carrying on his threat and cut through the ikken tobi at a. Bill: I decided against because of . Now if B d, W e doesn't look so good for Black. I do not want to run out because of White's ponnuki. Black can IMO better connect immediately and wait for White's answer. This is one option. at a and at b another. 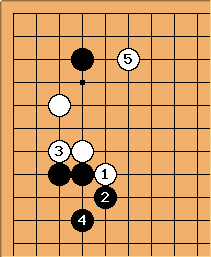 Compare this diagram with the game, where Black throws away a stone at a instead of getting the extension as here. JoelR: Without the cutting stone, can't be at c? With the intention of cutting off when possible, or extending one line lower to shut Black in? Bill: You are right, Dieter, Black should simply connect. But surely is better for White. Not very pleasant either. at a or b may be even more severe. dnerra: Hmm, here I disagree (naturally, as I played the White move you criticized ;). 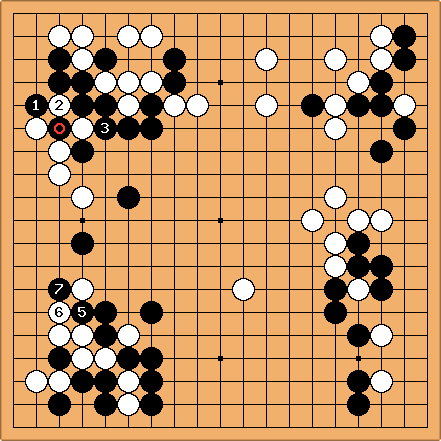 After , Black can just treat the marked stone lightly and play at c, for example. Also, all your diagrams are good for White, but I am not so sure e.g. you first diagram "Wrecking the shape" is worse for Black than the diagram "White blocks" given above by kokiri. Dieter: That may be true. I agree that blocking yields a better follow-up to the peep than turning. Probably the turning is worse than the peep, due to inconsistency. JoelR: I would try , which is a vague threat to run out towards . 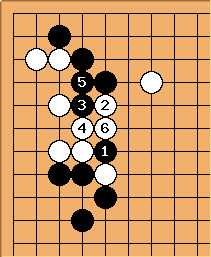 If White blocks, then the aji in may be enough to settle Black. There's also some aji in the corner, but maybe not it can only be spent once. dnerra: Sorry for my strong words, but here is out of the question -- it has to be at . Never forget to take profit while attacking! minue622: I agree with jantiff and dnerra. White should have played , the move to make better result than our real game for white. Kokiri - This looks pretty good for white, IMO, I think the problem is that black is playing too heavily with . Black is playing in whites sphere of influence, and so ought to be playing lightly. Shaydwyrm: My idea with was to allow black to play a in sente to settle the group in a pinch. 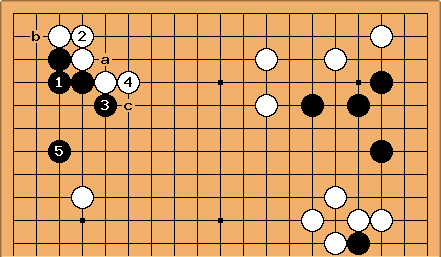 If white chose to respond at b, black would get c as well, gaining something approaching life in the corner. 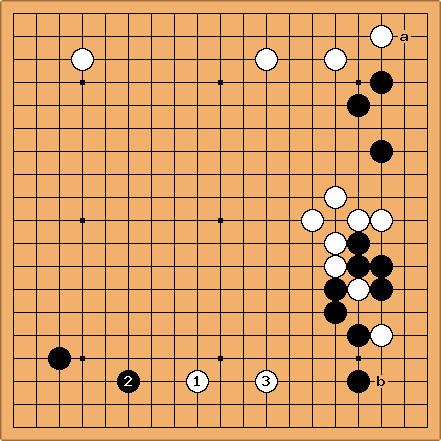 If white played d to capture instead, black would retain good moves to get out ( ). jantiff: builds a nice top... but it still pushes from behind; after , Black is settled. So what about at ? minue622: If white play pincer like , black would play . It is not so hard to stabilize this black group. Shaydwyrm: strikes me as being too close to thickness, that is, white's one point jump to the right. in the previous diagram seems more than adequate, taking some territory and leaving black with the question of how to handle his two groups on the top and top right, neither of which seems completely stable. 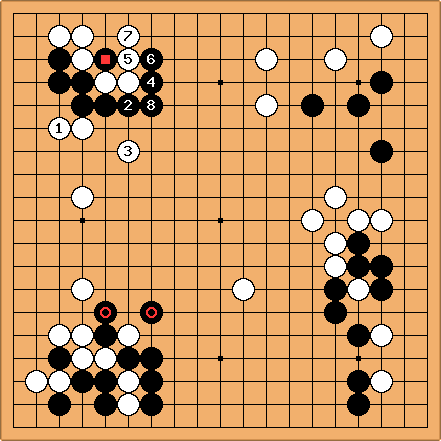 a and b look like white's sente. minue622: I agree with BILL's , but not with Black's 2 lines extention -b. White's center influence is scary or has potential for making territories. So, I would play . Bill: I was thinking about the kakari at b. 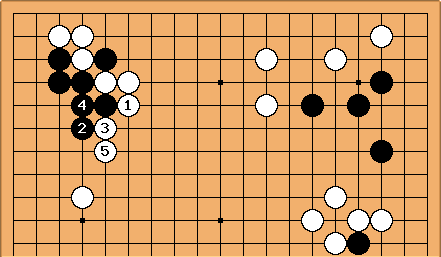 If White responds at a Black can extend to c.
dnerra: I wouldn't have played either; but I think the decision to tenuki and enter White's sphere of influence shows excellent judgement. Shaydwyrm: Entering white's sphere of influence here looks big, but not necessarily urgent. I would be very concerned about black's group in the top right - if black had played something less pressing, like a or b, as white I would have been inclined to ignore it, allowing the double approach, in favor of attacking black's group in the top right with a move like d.
Velobici: This lower right hand corner appears to be pretty complicated. Any thoughts as to local continuations. White appears to have a lot of aji. 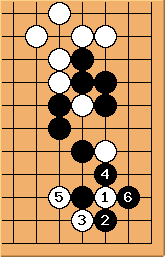 Shaydwyrm: In the game, white approached at "a", but to my kyu sense this move gives me the wrong feeling. The severe one-space pincer at "e" feels almost too good too allow, since black's thickness starts working so well. I was considering two possibilities in this area, the more distant approach at "b" and a wedge somewhere around "c". 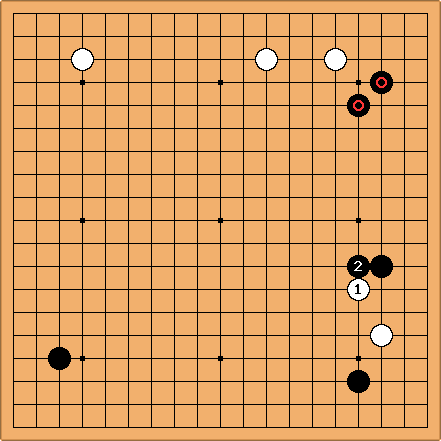 I am not convinced though that either is the correct move, since, as Jakub implied, the wedge permitting a shimari seems to leave black with an awful lot of territory, and the distant approach is still far enough away from black's wall to allow a close pincer to work well. Right now I am leaning towards the distant approach, since a pincer would at least allow white to much about in the corner with the attachment at "d". Thoughts on the best way to handle the bottom side here? Shaydwyrm: This seems ok, but black seems to have gotten his way here - the bottom space was too wide to secure a moyo easily anyway, so as black I would be well satisfied with the corner territory, and he gets to take another big point on the left side too with an approach in the top right. 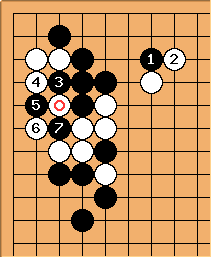 Perhaps, however, this is the best white can expect from letting black get so thick in the bottom right, and will have to try and seek compensation with an attack in the top right. And if that's the case, maybe black should play something like "a" instead of taking a big point on the left, and simply maintain his advantage in territory. Dieter: I think this is better for White than the game. I do not view the large knight's closure in the bottom left as secure territory. 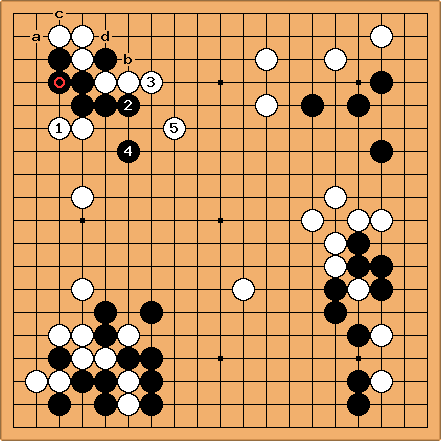 Black's bottom right is not secure either: it can be wrecked by a move at b. This move may well be miai with the extension along the left. unkx80: If here, then extends and makes a corner approach at the same time. Subsequently, Black a is big but feels somewhat constricted. Jeff: This last move (4) seems off to me (weak player). I'd have expected it on the left edge somewhere to extend and attack that black 4-4 stone. Isn't that the bigger play? Isn't the white base strong enough on the top (for now)? Or should I wait it out and see if white pulls some sort of trick that my eyes don't yet see? 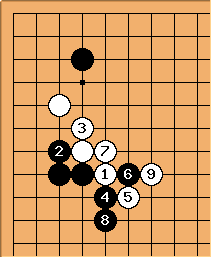 kokiri - isn't making a base for White's stones, it's a pretty strong attack on the two marked black stones, which are weak given the White ponnuki below. It looks like a pretty good move to me. Because of this, I would have been tempted to play at a to take sente, even though it allows W a kikashi at 3. What do people think of the variation below? Jeff: Kokiri, now that you show me this alternative where black gets first move in the top-right corner, it looks to me like a fifteen (or more!) point difference. 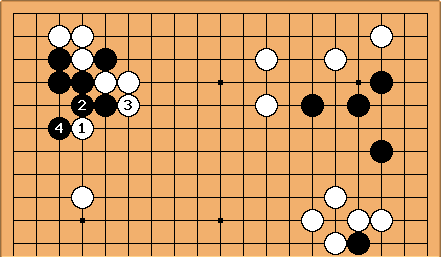 With black getting the first move, I see reasonable territory against the side/corner. With white moving first, I see black in high pressure, making life against the side and hurting white's ability to make territory there, but black not really making significant corner/side territory. Thanks for the explanation by example! JoelR: Yes, that was my intention with move 19. 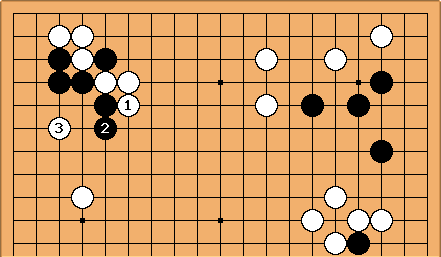 If White plays under, then he can connect the groups, but Black gets influence and sente. 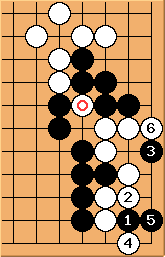 If White plays a ladder breaker, as in the game, then Black at a saves and strengthens the corner, and White should still make the ponnuki and Black has sente. term100? : How about this proposal: Anyone making a move pledges to make a donation on behalf of the victims of the Indian Ocean tsunamis. Jakub: In the present situation was it wise to strengthen the cutting stone ? My instinct would have been to treat it lightly. I suppose the fascinating thing about Rengo is that another participant can attribute a totally different meaning to one's move than one had in mind. Velobici: could be a mistake. Black and White both have three groups here that are cutting each other apart. 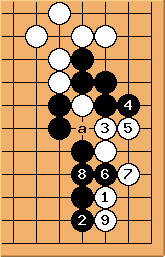 Two of the Black groups are single stones without nearby support. The single White stone has support it to which it can connect. 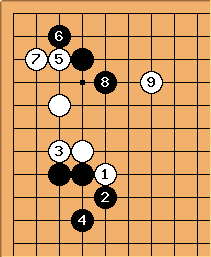 Appears to be hard for Black to capture , due to the weakness of Blacks on stones ( , ) and the White stone in the upper left that breaks ladders. Dont think that w6 is light at this time. White has not forced Black into an overconcentrated position or used w6 in order to save significant White stones, so has not yet fulfilled a purpose important enough to compensate for giving it away. Velobici: I dont see that continuation at GoBase, using this search diagram. That's not to say that the path laid out above is not correct...just that GoBase does not show it. The stand, , was played most recently by Cho Chikun vs Kobayashi Satoru in 1996 in the 20th Kisei round one in Amsterdam. (Even a blind squirrel gets a nut from time to time. ;) Even if Cho did lose that game ;( Cho played at the location of ...completely different line of play. 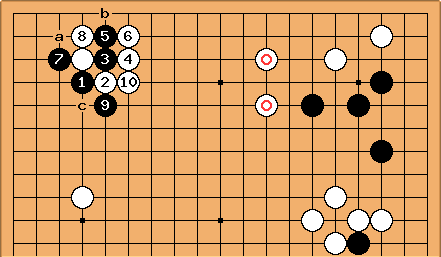 The two stones formed a three space extension on the third line along the left side of the board which allowed(?) Cho to switch to . Cho also had thickness in the lower left facing this position as well. In the variation below (Hane Yasumasa vs Sato Sunao 5th Judan 24 December 1965) please note that the order was different, the circled White stone attached to the circled Black stone and Sato desended to the third line immediately before in the diagram. Mef: It had been a while since I looked at it, so I just double checked, you're right, in my diagram is played as a double hane, not a nobi. JoelR: Why isn't this a case of Hane at the Head of One and a Half? I would have cut at the cutting point immediately, but I didn't have the guts to do it in the Rengo. This variation is listed immediately as an alternative which allows a prompt second approach to the corner stone. This complicated variation has occurred in play ("Essential Joseki" p.41, Diagram 29), when white attaches underneath instead of making a second approach. This is the final position. The question is: can Black make good use of his thickness? I believe in our rengo, it would be advantageous for Black. 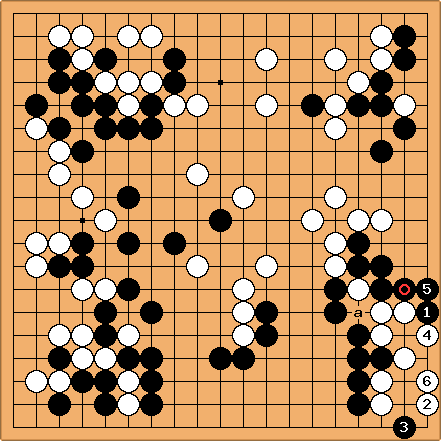 Do the pros really play when Black has something like the stones? says, Thank you, it seems to me. , (10 in the game record) touches a the weak Black stone. As result, the circled Black stone is strengthened and the Black position on the right gains. at 'f' would have minimized the damage to White by walking ahead?. 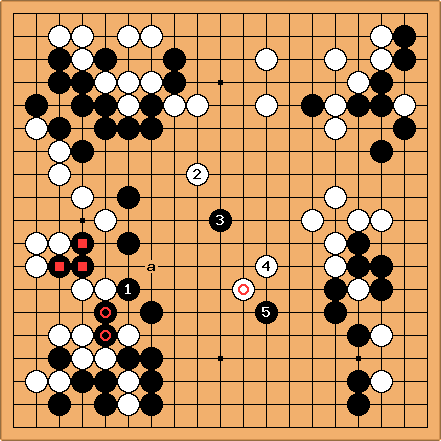 White remains weak, with three distinct problems: the White group does not have base, the stone has a liberty shortage and the White group has a connection problem at 'f'. 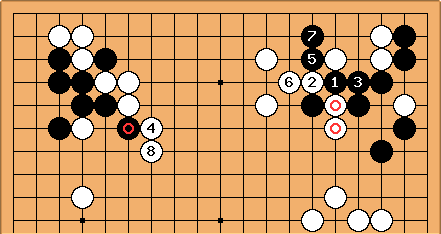 Currently, White needs to find a way to stablize these stones and get sente to attack the single Black stone in the corner (marked with a square).